Since being unjustly deported by the Harper Government in 2012, Fernando Lara has been sharing his powerful work with children and youth throughout México and Colombia. 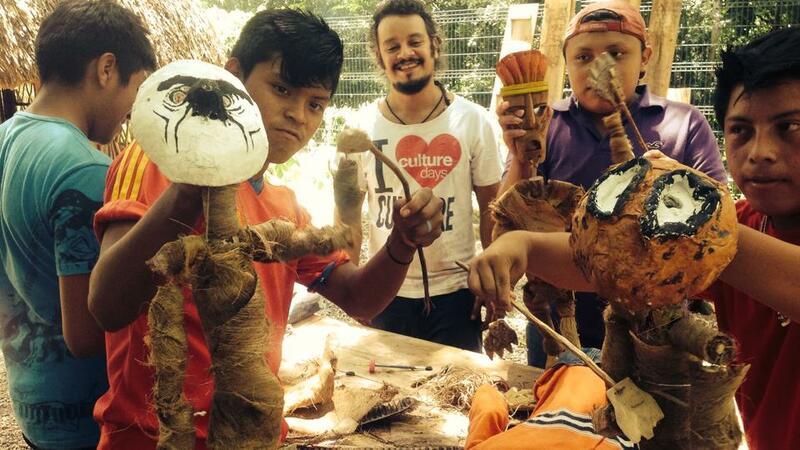 Artistic Director Fernando Lara is facilitating Campamento de la Paz in four Indigenous communities fusing clown practice, theatre, music and art with Children's Peace Theatre's methodology of Conflict Transformation. Using the three C's- Courage, Compassion and Creativity, La Bufon is helping to Create a Culture of peace guiding children and youth to transform their conflicts and reclaim their Indigenous identities. La Bufon also facilitates clown workshops and shows in conflict, post conflict and natural disaster zones, and offers expertise and mentorship to Clowns in training as a revenue generator for the company. La Bufon was invited by Maya Research Program (MRP) to facilitate a identity recovery program using the arts with children and youth. The community is a strategic archelogocical site that serves as an important model for other communities. La Bufon is supporting the work of the MRP to strengthen language skills, cultural identity and help young people recover from the impacts of colonization, protect natural resources and reclaim knowledge about traditional and medicinal plants. La Bufon was invited by the Institución Etnoeducativa Distrital Bunkimake en Magdalena, Santa Marta Colombia to learn about Indigenous education and share art skilss with the children and youth. The elders were happy to receive the artists to help them create a holistic education for the young people. The Elders had a dream and now they are living it. The story of Cherán's resistance goes back centuries to when it held off the Aztec empire, a foreshadowing of the spirit of independence that enabled it to take on organized crime and successfully re-establish political self-governance and self-defense in 2011. La Bufon was invited by the Asociación de Cabildos Indigenas del Norte del Cauca to conduct art workshops focussing integrating arts to reclaim their traditional wisdoms and rituals. El Cabuyo is a conflict zone where the Nasa people are resisting the government and the Guerilla's for their land and reclaiming ancestral wisdoms and traditions. Fernando (nano) Lara doing humanitarian Clown in Bunkwimake, Sierra Nevada, Colombia.